Most parents look for a reliable swimming school to ensure that their kids learn to swim safely and properly and be able to handle themselves in any kind of aquatic environment. It can be because the kids are going to be swimming in the local community pool, canoeing on the lake at camp, having fun at a waterpark, swimming with friends in a backyard pool or planning to become an Olympic athlete. They all start off learning to swim the same way. To help kids learn to swim properly, pool platforms can play a vital role. PoolDocks offers portable swimming pool teaching platform for swim schools which can be used to teach tots and toddlers how to swim, to gain self-confidence and not to fear water. Of course, the pool platforms can also be used by kids as a fun way to enjoy themselves in the pool. Many of the designs incorporated by PoolDocks vary in height, capacity and shape and are based on suggestions received from swim school instructors from across the country. The PoolDocks structures are designed for use primarily for young children weighing up to 110 lbs., however, they are not designed for heavier children, adults or aggressive play. PoolDocks learn to swim platforms for use by babies, tots, and toddlers are safe, compact, lightweight, portable, and durable. The PoolDocks are modular structures made from rugged and colorful plastic components by QuadroTM that can be quickly and easily assembled by adults. They are easy to remove from water, and simple to maintain and store. As there is a possibility of kids trying to swim underneath the platform, we have created a special “closed” version which includes side panels to completely enclose the platform. These closed versions are not designed for frequent moving in and out of pools. From the smallest portable bench for just a couple of kids in shallow waters to larger, more permanent, platforms for multiple children in the deeper water, PoolDocks platforms are designed to meet a range of swim school needs. If needed, Pooldocks can also custom design a platform to meet some specific need identified by a swim school. All the QuadroTM components used in the platforms have rounded corners, thus making it completely safe for young children as well as instructors, and will not tear up pool liners. While it rarely happens, if a QuadroTM component breaks over time, it can easily be replaced without having to throw away the whole platform. Some swim schools even use the “land” based play structures for the waiting room area. All swim school staff know the important value of water safety when dealing with young children. PoolDocks encourages responsible adult supervision at all times and strongly supports everyone following all pool safety rules as well as using common sense. In addition, it is important that the pool platforms be inspected on a regular basis and not to be used until missing or damaged components are replaced. 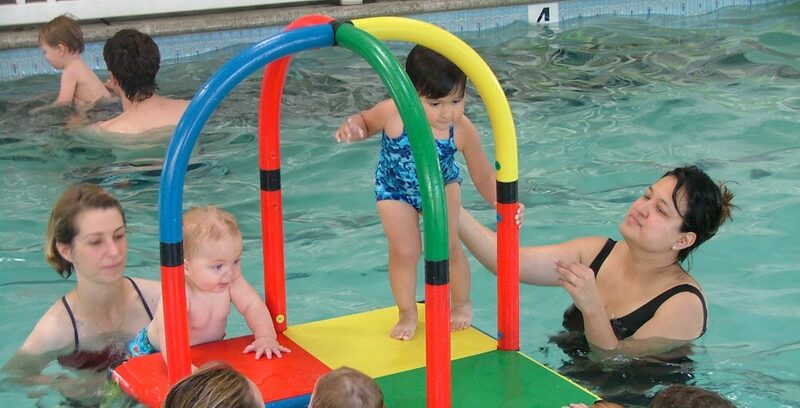 Learn to Swim Platforms for Kids – Compact, portable aquatic swim platforms designed to provide all swim schools and aquatics facilities with colorful and durable tot and toddler training platforms. The tot docks are made of precision engineered thermoplastics and can be safely used in chlorinated pools. The tot-docks are easy to assemble and easy to maintain. For more..